Happy days are here in Regina. For the non-Canadians, our long suffering football team (Saskatchewan Roughriders) are having a #1 season for the first time in about 30 years........ 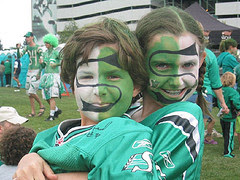 Above are my niece and nephew, Kate and Niall when they attended Sunday's football game here in Regina. No news yet for me. I had the CT scan yesterday and it went very smoothly actually. I will find out the results tomorrow when I go in for my next chemo treatment. I will post about it as soon as I can. We had fun didn't we? What a great picture! Go Riders Go! !